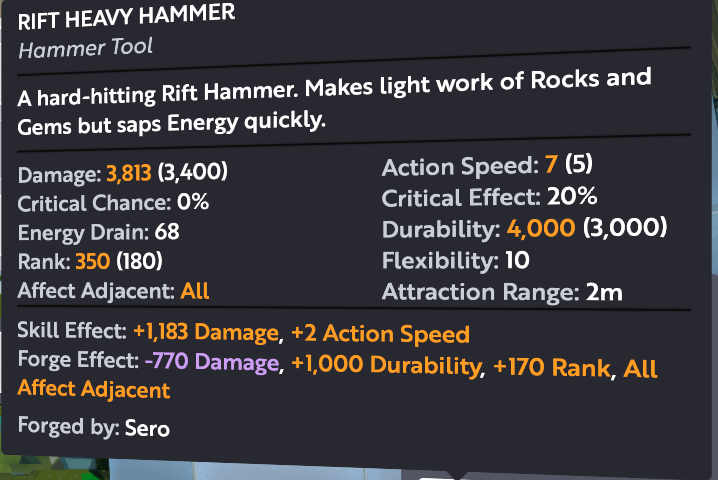 What would you pay for a Rift Heavy Hammer? This on my forger, that is why the damage looks lower… However this will one shot T7 if you have your stats right. I would price a diamond hammer with 3x3 aoe, busy bee, and damage, at about 8k. Given how the above hammer has twice the durability, I would say its worth 16k. Don’t forget how much energy drain this has tho. I will say it’s a nice hammer but I couldn’t see myself paying 16k for a hammer like this. 12-13k probably. But just because I wouldn’t doesn’t mean someone else wouldn’t. I think 10-15k is a fair assessment, if we’re being practical anyhow. There might be a few here and there that sale for more because ‘I just have to have one’ but once the newness of things wear off and how much drain these things have I think 10-15k is where we’ll see it average around. I would rate this lower than forged dia hammer atm. Just cause theres no use for it.